Help improve the Saint Mary & Saint Joseph history pages. Photos taken pre 1970 are needed. Any information will be appreciated. In the fall of 1894, a group of men from the area organized and founded St. Joseph’s Parish in Sheppton. They built a church on the corner of East Oak and Shepp Streets and Father John Pribyl came from St. Joseph’s, Hazleton, to administer to the early parishioners. Father Joseph Kasparek, Pastor of St. Mary’s of the Assumption Church, McAdoo, realized that although St. Joseph’s was in Schuylkill County and therefore should belong to the Archdiocese of Philadelphia, it was being served by priests of the Scranton Diocese. He went to Archbishop Patrick J. Ryan, D.D. who confirmed that St. Joseph’s of Sheppton belonged to the Archdiocese. There Fr. Kasparek came to Sheppton every Sunday and Holyday to administer to the spiritual needs of the people. The church was consecrated on August 15, 1895 and the first Mass was celebrated by Father Kasperek on April, 1896. Father Kasparek was officially appointed the first Pastor on May 30, 1896. The parish grew rapidly and soon after property was purchased next to the church and a short distance away land was bought for a cemetery. The men mainly accountable for the organization were Joseph Repko, Andrew Macus, Rafael Recla, Andrew Volansky, Andrew Titelage, Michael Novatnak, Samuel Kakaley, Andrew Klein and Mr. Fidlic. Until the church was built, Mass was celebrated in Recla’s Hall. The statue of the Blessed Virgin for the first church was donated by Mrs. Marchetti; Louis Piz, Sr., donated the statue of St. Anthony; Mr. and Mrs. Raphael Recla donated the pews and Mrs. MacNamara presented the organ which was played by Andrew Danarko. 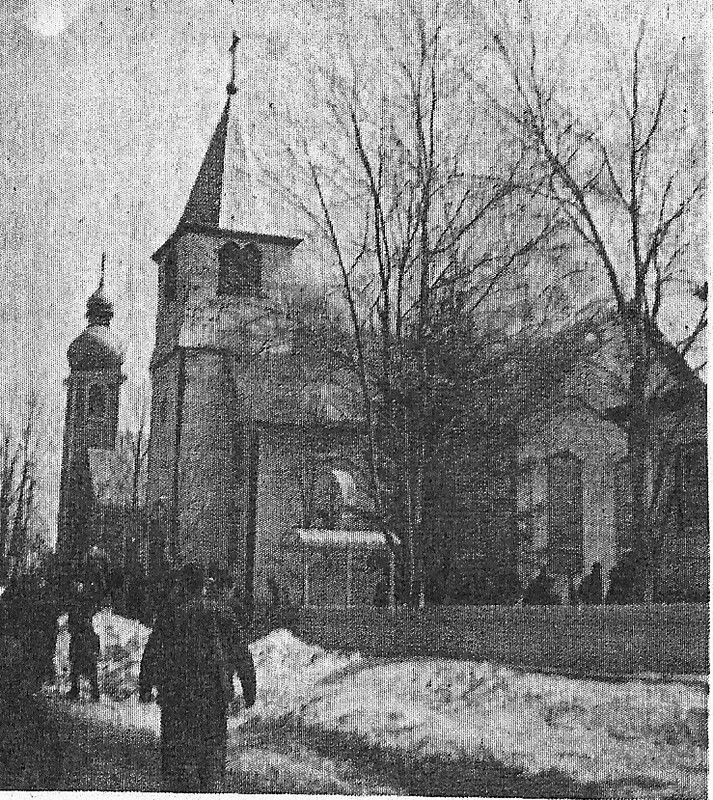 The furnishings of the church were supervised by Mr. Repko, who died the day after the three bells were installed. Thus he was the first for whom the bells were rung and he was also among the first to be buried in st. Joseph Cemetery. The Women's Catholic Club organized on Sept. 10, 1934 by Father Joseph Novorolsky had the following officers: President, Mrs. John Saxa, Secretary, Mrs. John Vozar and Treasurer, Mrs. John Yencho. On March 19, 1940, the parishioners gathered to attend Mass in honor of St. Joseph, the patron of the parish. An hour later, the church was destroyed by fire. Almost immediately, the people and the pastor, Rev. Joseph A. Baran, began to build a new stone church. Msgr. James Heir, V.F. officiated at the laying of the cornerstone on November 28 1940 with nearly 200 people witnessing. The Sheppton High School band with William Walters conducting presented sacred hymns. Rev. 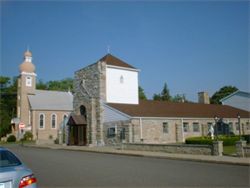 Paul J. Lisicky, pastor of St. Michael's, Lansford, preached in Slovak; Father George M. Petro, D.O., pastor of st. John the Baptist, Allentown gave the sermon in English. Msgr. Heir brought congratulations and blessings from His Eminence, Cardinal Dougherty. On Christmas morning at five o'clock, Mass was celebrated for the first time in the new edifice, even though the building was not yet completed. A Solemn High Mass on March 19, 1941 marked the completion of the new church built by the congregation. Blessings of the new church took place Thursday, November 27, 1941 at the 8:00 AM Solemn High Mass said by Father Baran. Deacon of the Mass was Father John E. Senglar, STL, Philadelphia and Subdeacon was Father Stephen Poniscak of Middletown. At 3:30 that afternoon, Auxiliary Bishop Hugh L. Lamb, D.O. blessed the new church, congratulated the parish and exhorted them to continue working for the greater honor and glory of God until until they reach their final goal. Benediction followed with Bishop Lamb officiating, Father Paul M. Pekarik deacon and Father Michael P. Sverchek, subdeacon. The new edifice is 54 feet wide and 94 feet long outside, and is build of quartzite. The parishioners hauled the stone by truck from local strippings. The concrete footings, steel work and stone walls are structurally sound enough to support a superstructure. statue by the Parish Rosary Society: the Pieta statue by St. Stephen's Slovak Parish, Rev. Stephen P. Basovsky Pastor; the votive stand by the parish Rosary Society. Also donated: Sanctuary Lamp by Misses Elizabeth and Cecilia Baran, Bethlehem; Sanctuary Lamp in memory of Henry Konschnick by Mrs. Mary Konschnick; Votive stand and two gold vases by Mrs. Mary Salvaterra; Votive stand in memory of Mr. and Mrs. John Robel, Sr.; Tabernacle at Our Lady's Altar in memory of Mr. and Mrs. Fredrick Fellin, Sr.; and the Tabernacle at st. Joseph's Altar, gift of Mr. and Mrs. Donald Stockdale, New York. Sverchek's tenure, the church has had extensive repair and refurbishment: 1959: foam cushion kneelers, terrazzo floor and altar platform installed, roof repairs and aluminum siding on the belfry; 1960: carpeting in the sanctuary; 1965: electric heating system installed; 1966: loudspeaker system; 1968: wrought-iron altar railing; 1969: installation of Schulmerich carillon in October commemorating the 75th anniversary of the church. The beautiful hymns played on the Carillon are a source of edification to many residents in both Sheppton and Oneida. The Carillon rings for the Angelus three times daily and also rings before Mass on Sundays and for Holydays. In 1971 new carpet was installed in the Sanctuary and on March 1, 1973 a new Allen organ was donated by the Volansky Family in memory of Stephen E. Volansky. In 1976 two altars - an altar of sacrifice and an altar of repose were donated by two parishioners and lecterns were purchased. In 1979 a new slant roof was put on the church and the pointing of the belfry was finished. Father also supervised the installation of paneling in the sanctuary, and book racks in the pews. In addition to interior work, the exterior of the church was well cared for with shrubbery, amesite walks and brick walls around the church property. In 1958, the old two-room brick public school building was purchased and renovated with new plumbing electrical work, addition of a furnace room and completely furnished kitchen. Open House was held on Mother's Day, 1959 and it became the parish hall. For about twenty years it was used for meetings and social affairs until maintenance costs forced it to be closed. The parish rectory has had aluminum spouting put on and oil heat installed as well as a new roof. In the cemetery, the road was paved with amesite in 1963 and a well was dug in 1968.
said at the chapel each weekend since June 27, 1971. A dedicated priest, Father Sverchek leads monthly Novenas to the Sacred Heart on First Fridays and to Our Lady of Fatima on First Saturdays. Eleven parishioners have had their homes and families dedicated to the Sacred Heart when Father installed them into the "Men of the Sacred Heart ". On First Friday evenings since September, 1982, the Blessed Sacrament is exposed in the church or chapel for public adoration after the evening Mass until midnight. Public high school students receive their religious education from Father weekly and the school students are instructed by Catechists Mrs. Dolores Gius, Mrs. Suzanne Tanner and Thomas Gulash. The parish choir is prepared to sing for Christmas, Holy Week and Easter and other special occasions by the organist and choir director, Benedicta M. Guydish. The parish also has two assistant organists: Terri Ann VanBlargan and Matthew Feeko. At present there are 5 regular lectors, Ceorge Macus, Jr., Joseph Macus, Tom Gulash, Creg Cius and Joann Careyva; during the summer, several college students return to help at lectoring or commentating. Altar boys include Creg Gius, Brian Wolk, Robert Wolk, Jr., Matthew Macus, James Wolk, John Guydish, Joseph Ney, Matthew Singley and James Tanner, Jr. The (1984)parish has 171 households and 372 members. Father Sverchek celebrated the 50th anniversary of his priesthood with a Mass of Thanksgiving on May 20, 1984. He was joined by 14 priests, his family, parishioners and friends on that happy occasion. May God Bless him always! Rev. Raymond P. Slezak, succeeded Father Sverchek in August of 1992. Father Slezak's energy and enthusiasm has resulted in many changes to St. Joseph's, including remodeling and refurbishing the church, chapel, and rectory; perpetual care for the parish cemetery; and reinstitution of a parish picnic. Under the guidance of Father Ray, St. Joseph's continued to thrive as a spiritual community.